An amazing and romantic city, Venice’s cultural wealth and heritage attract visitors in the thousands. Built on a lagoon and born of the sea, La Serenissima is a city of palaces, bourgeois mansions and museums, testifying to its splendour in times past. Novotel hotels welcome you to an exclusive setting for a stay imbued with charm and discovery. Begin your visit with St. Marks Basilica in St. Marks Square, and then climb to the bell tower for a breath-taking view of the city and the lagoon, before taking coffee in the famous Caffè Florian, established in 1720. Stroll through the San Marco district and then visit Dorsoduro district behind the Zattere, the quays, to explore the Peggy Guggenheim museum. Take time off to visit the Palace of the Doges, the Ca’ d’Oro, one of the most beautiful Gothic palaces in the city, and the Ca’ Pesaro palace, a marvel of baroque architecture. Don’t miss the opportunity to take a gondola ride on the Grand Canal, lined with extraordinary mansions and palazzi, or to admire the view from the Ponte di Rialto. Do you have a little extra time? Then explore the monumental church of Santa Maria della Salute which stands on a forest of stilts in the lagoon and visit the island of Murano, the largest in Venice, famous for its glassware. Don’t miss the multi-coloured island of Burano, famous for its lace. 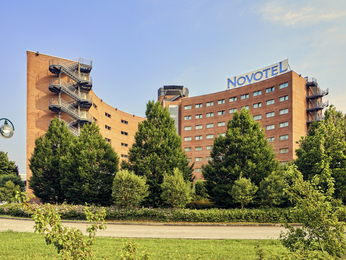 Our Novotel hotel awaits you to explore the city in depth in a calm and restful atmosphere.